Some homes exude a different level of design, elegance and beauty. 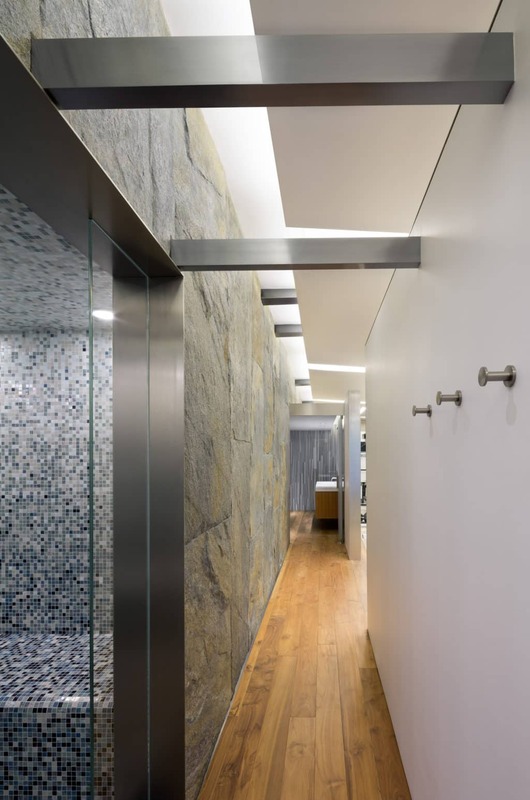 The Monaco Dr. residence, designed by The KAA Design Group, was a challenging hillside project that tasked the designers with an unusual layout for a new pool and gym complex for an existing home. 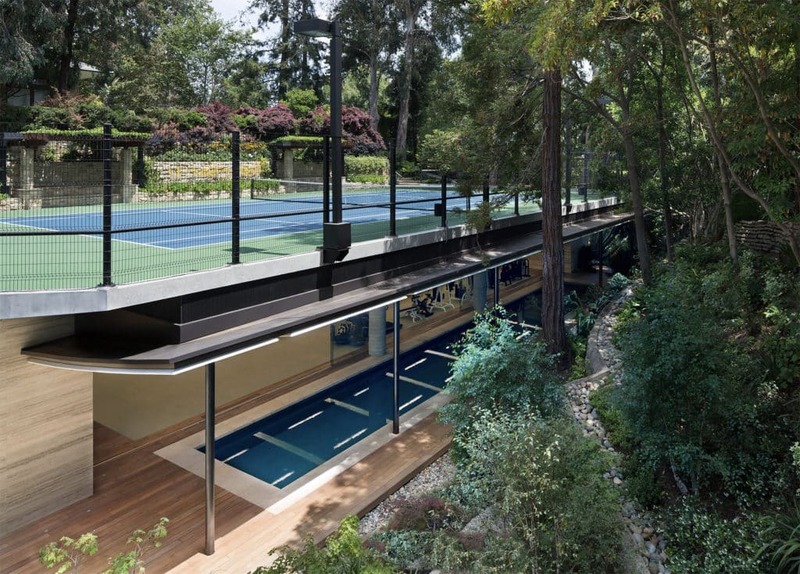 Not many people can boast about having a 6,000 square foot gym and spa area tucked below their existing tennis court. 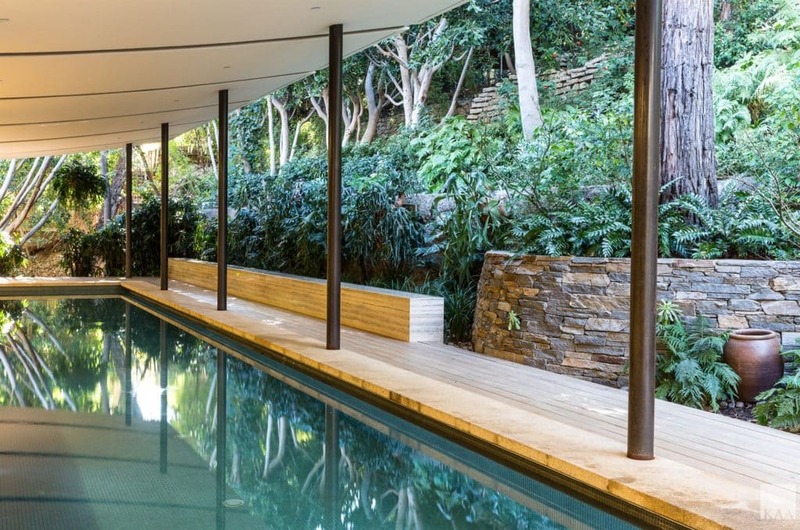 This property design does well at preserving the surrounding landscape, keeping the secluded vibe of the topography. 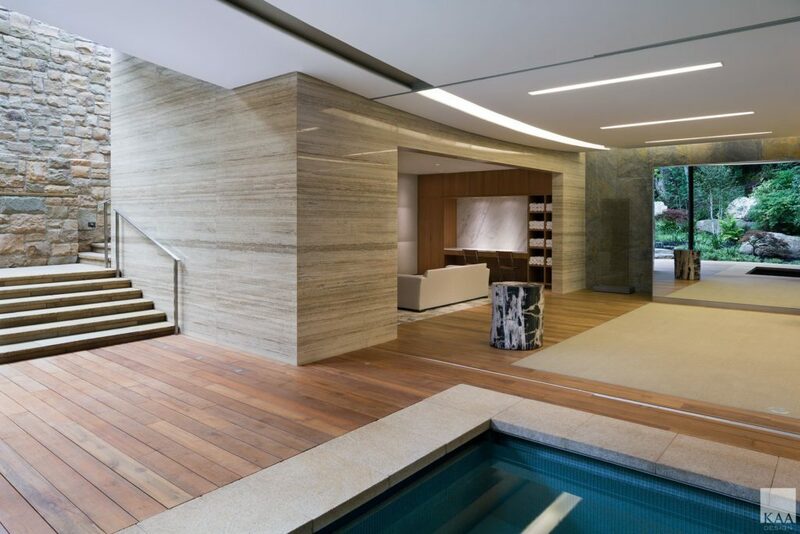 While it’s independent of the tennis court structure above, the new spa houses workout facilities, an Olympic lap pool, steam room, spa baths and lounge, all utilizing 100% reclaimed teak decking & flooring from Indoteak Design. 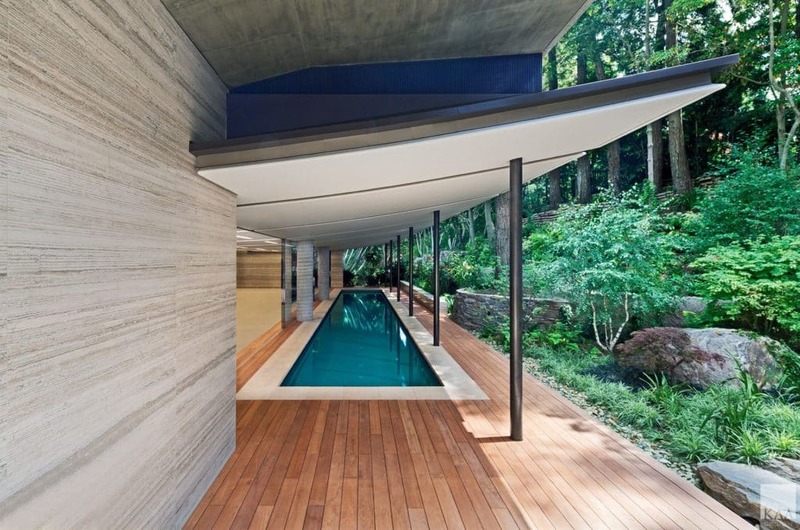 The stunning covered pool is lined with Indoteak Designs 100% reclaimed teak decking. Our materials are FSC Recycled, 100% teak wood delivered directly from our longtime partners located in Indonesia. We supply our reclaimed teak clean, that means no added formaldehyde and VOC-free finishes, both in the production and during the installation process. This ensures the highest-grade hardwood without the worry of tarnish by harmful chemicals. Our reclaimed teak is available in variations of rich colors and emits a warm, almost leather-like aroma. Unlike most woods, our reclaimed teak holds high levels of resinous oils and a high silica content which keeps it from shrinking, swelling or warping. As you can see, this wood has a reputation of extravagance because the products created from teak withstand the test of time without losing any of its luster. This angle shows the beauty of the landscape that surrounds the home. The natural beauty of the reclaimed teak blends the modern design with topography. Many of the worlds most beloved woodlands are diminishing at an alarming rate as the result of deforestation and non-sustainable logging. One of the the major culprits in this crisis is improper or, in some cases, non-existent systems of recycling. Indoteak Design is committed to providing the highest quality products while also striving to cause no harm to the environment. We properly utilize FSC Recycled, 100% teak salvaged from Indonesia and we are proud to say that our production works as a zero-waste process. This means no trees are cut down as a result of our work. Instead, our salvaged teak from from 100-300 year-old structures become beautiful home goods instead of rotting in a landfill. This rare, beautiful wood, aged by time and the elements, is then refined without any VOC or leeching glues, ensuring the safety for your family or business. 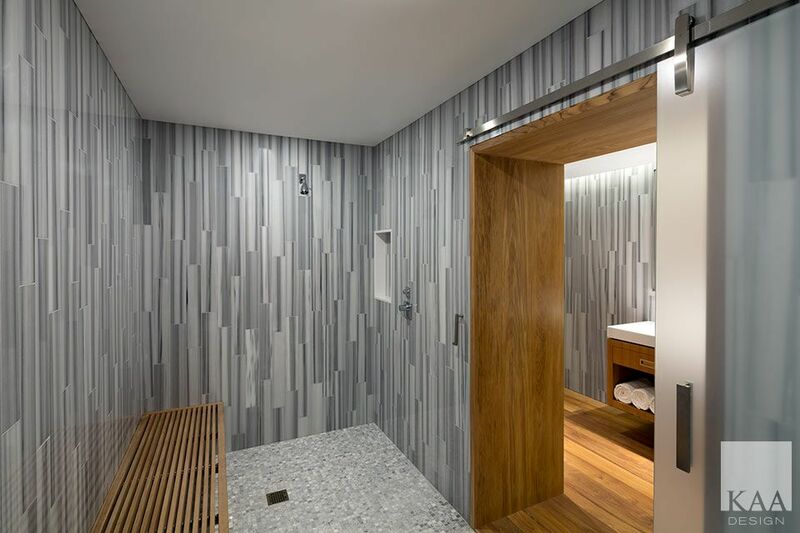 The gorgeous Sauna/steam shower room. Indoteak Teak Design 100% FSC reclaimed teak is perfect for any wet/dry areas. Teaks natural resistance to moisture is because of its high silica and oil content. The built in gym and lounge area is open directly to the outside with a retractable wall. Stunning hallway featuring stone tile and Indoteak Designs 100% FSC reclaimed teak engineered flooring in San Smooth. The water resistant qualities make it the perfect flooring for any home or business. The seamless transition between outdoors and interior. Outside is 100% FSC reclaimed decking and inside is 100% FSC engineered flooring by Indoteak Design.